Noteworthy: Grand Rapids has won 12 of the last 14 meetings overall, outscoring the Rampage 57-29 in that span. Noteworthy: Grand Rapids has won the last four matchups. Status Update: The Grand Rapids Griffins split their two games last week and are tied for second in the Central Division with a 34-18-6-4 record (78 points). They trail first-place Chicago by three points. Grand Rapids has earned points in 11 of its last 14 outings (8-3-3-0) and in 16 of its last 21 (13-5-3-0). The Griffins continue their season-high six-game, 11-day road trip this week with a pair of games against the San Antonio Rampage and Texas Stars. Grand Rapids is in a stretch of facing 20 consecutive division foes (6-3-3-0 record so far). Friday vs. Rockford - The Griffins are 3-2-4-0 in the 10-game season series...Grand Rapids had its eight-game home point streak (6-0-2-0) against Rockford snapped...The Griffins also saw their six-game overall home point streak (4-0-2-0) ended...Grand Rapids outshot Rockford 48-20, recording a season high in shots...Matt Ford tallied his 10th goal of the season and has lit the lamp in back-to-back contests...Turner Elson banked his 15th marker of the campaign...Vili Saarijarvi skated in his 100th Griffins/AHL game...Patrik Rybar's shutout streak was snapped at 102:57 after Andreas Martinsen's goal at 6:38 of the first period. Saturday at Milwaukee - Grand Rapids is 6-1-0-1 in the 10-game season series...Defenseman Libor Sulak scored his fourth goal of the season and Matt Puempel produced his 23rd...Puempel was the only scorer in the shootout...Harri Sateri stopped 30 of 32 shots in regulation and all three in the shootout to notch his career-high 19th win of the season...The Griffins are 12-3-0-0 all time in the regular season at Panther Arena...Carter Camper skated in his 500th pro game...Grand Rapids played in its 20th game that was tied after regulation, tying a single-season franchise record. Road Trippin': Grand Rapids will play 10 of its final 14 games in enemy territory, including its current six-game road swing that lasts until March 26. The Griffins have points in 10 of their last 14 contests on foreign ice (7-4-2-1). Chris Terry (13-9-22) and Matt Puempel (11-10-21) pace the team in scoring in away games. In his last five road starts, Harri Sateri is 3-1-1 with a 2.55 GAA and a 0.917 save percentage. Suite Life: This week in Texas marks the fourth, fifth, sixth and seventh of nine road games the Griffins will play in the month of March. This season is the eighth consecutive in which Grand Rapids hits the road for seven or more contests in March (7 in 2017-18, 10 in 2016-17, 8 in 2015-16, 7 in 2014-15, 9 in 2013-14, 11 in 2012-13 and 9 in 2011-12). 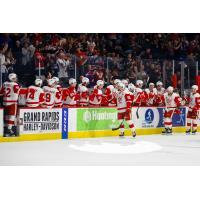 Despite the lack of home games, the Griffins have posted an overall winning record in March in 10 straight years, combining for an 81-43-7-8 (0.637) mark since 2008-09. The Griffins played just two road games in February, their fewest since having two in 2011-12. Griffins in General: Grand Rapids became the first team in the Western Conference to hit the 70-point plateau after a 4-3 shootout win against Texas on Feb. 22...The Griffins became the fifth team in the league this season to reach 30 victories after a 3-2 overtime win vs. San Antonio on Feb. 16...Grand Rapids achieved 30 Ws or more in its first 53 games for the sixth time in the last seven seasons...The Griffins' 3-0 win against Milwaukee on Jan. 19 marked the franchise's 950th all-time regular season victory...Grand Rapids is 961-647-27-57-112 (0.587) in the regular season since 1996-97...Grand Rapids' 301 regular season wins and 652 points since the 2012-13 campaign are both the second-most in the AHL in that time, trailing only Toronto (312 / 674) and just ahead of Wilkes-Barre/Scranton (298 / 644). Wade For It: In 22 GP in 2019, Wade Megan leads Grand Rapids in points (23), goals (12) and plus-minus (+13), while tying for third in assists (11). He has tallied six points (2-4-6) during his current four-game point streak. (Don't) Put It In Reverse Terr: With 27 goals (T7th in AHL) and 55 points (T15th) - both team highs - Chris Terry has surpassed the 50-point mark in his seventh consecutive full AHL season. Owning 495 career AHL points, he needs five more to become the 96th player in league history to amass 500 or more. Puemped Up: The 40th player in franchise history to record 100 or more points in a Griffins uniform, Matt Puempel has found the scoresheet in nine of his last 12 games (6-6-12). The sixth-year pro leads Grand Rapids with 16 multi-point outings and seven power play goals while placing second in both goals (23) and points (48). His team-high 206 shots are third in the league. Puempel has reached the 20-goal plateau for the third time in his AHL career and in back-to-back campaigns after depositing 23 last season (22 with Grand Rapids, 1 with Hartford). Page Turner: Sixth-year pro Turner Elson has set new career highs this season in both points (33) and assists (18). His 15 goals are the most since scoring a career high 17 in 2014-15 with Adirondack. You're a Wizard, Harri: Harri Sateri is on a five-game point streak (2-0-3). In his last 13 appearances, he is 8-2-3 with a 2.25 GAA and a 0.920 save percentage. The Finnish netminder stopped 30 of 32 shots in a shootout victory at Milwaukee on March 16 to pick up his 19th win of the season, setting a new AHL career high. Rybar Supports: Patrik Rybar is 6-3-0 in his last nine starts, showing a 2.00 GAA and a 0.931 save percentage with a pair of shutouts in that time. In his first season in North America, Rybar ranks third in the AHL with a 2.29 overall GAA. Frkin' Right: Since being assigned to Grand Rapids on Feb. 14, right wing Martin Frk is averaging better than a point per game with the Griffins (4-6-10 in 9 GP) and posts a team-best plus-nine rating in that time. He has picked up six points during his five-game point streak (3-3-6). Free Hockey: Last Saturday's shootout win at Milwaukee marked Grand Rapids' 20th game this season that was tied after regulation, matching the single-season franchise record set by the 2008-09 and 2006-07 teams. The Griffins are 5-6 in overtime this season and 5-4 in a shootout. Friendly Confines: The Griffins have points in six of their last seven home games (4-1-2-0) and in eight of their last 10 (6-2-2-0). With a 22-6-3-3 overall mark inside friendly confines, the Griffins pace the league in home points (50) while ranking second in wins (22) and fourth in points percentage (0.735). Grand Rapids is a +22 in goal differential at home while averaging 3.21 goals and operating at 18.62% on the power play, compared to -8, 2.75 and 8.70% on enemy ice. Chris Terry (14-19-33), Carter Camper (10-19-29) and Matt Puempel (12-15-27) lead the team in scoring at home. Harri Sateri is 13-2-2 at Van Andel Arena with a 2.37 GAA and a 0.910 save percentage while Patrik Rybar is 9-4-4 with a 2.31 GAA and a 0.916 save mark. San Antonio Notes: Current record 27-31-6-0, 60 points, 8th Central Division...Grand Rapids has won 12 of the last 14 meetings overall, outscoring the Rampage 57-29 in that span...Grand Rapids is 4-2 in its last six trips to San Antonio...The Griffins have been shut out in their two appearances at the AT&T Center this season (4-0 on Oct. 6 and 2-0 on Feb. 1), and have not scored since the 14:03 mark of the third period during a 6-2 victory at San Antonio on April 12, 2018, a scoreless stretch of 125:57...In the last meeting on Feb. 16 at Van Andel Arena, Grand Rapids scored two goals 1:26 apart late in the third period to tie the game and set up Filip Zadina's game-winner eight seconds into overtime...The Griffins have won eight in a row against the Rampage at the Van...Zadina (2-4-6 in 6 GP) and Wade Megan (4-1-5 in 5 GP) lead Grand Rapids in the season series...Patrik Rybar is 3-0-0 with a 2.35 GAA and a 0.923 save percentage against San Antonio while Harri Sateri is 1-2-0 with a 2.38 GAA and a 0.909 save mark. San Antonio Connections: Second-year Griffin Turner Elson spent the 2016-17 season with San Antonio and scored three points (1-2-3) while being limited to 13 games due to injury...First-year Griffin Wade Megan appeared in 115 games with the Rampage from 2012-15 and totaled 31 points (20-11-31)...While making his AHL debut with the Rampage on March 28, 2013, against Grand Rapids, Megan scored his first pro goal against Petr Mrazek...Rampage netminder Jared Coreau suited up for Grand Rapids from 2013-18 and ranks among the franchise's all-time goalie leaders with 148 GP (4th), 8614:11 minutes (4th), a 2.44 GAA (T8th), 85 wins (4th), 13 shutouts (3rd), 3930 saves (4th), a 0.918 save percentage (T7th) and seven shootout wins (T5th)...Backstopping the team to its second Calder Cup in 2017, Coreau started all 19 games during the championship run and posted a 2.84 GAA and a 0.909 save mark to go along with a 15-4 record...In three career appearances against the Griffins, which have all come this season, Coreau is 1-1-1 with a 2.49 GAA, a 0.934 save percentage and one shutout. Texas Notes: Current record 31-27-4-3, 69 points, 5th Central Division...Grand Rapids is 4-2 in the season series, winning the last four matchups...The Griffins have points in nine of the last 12 games (8-3-1-0) at the H-E-B Center...Since the 2013-14 campaign, Grand Rapids is 19-7-1-1 in 28 games overall vs. Texas...In the last meeting on March 6 at Van Andel Arena, the Griffins scored three unanswered goals in the third period and won 5-2...Chris Terry produced a career-high five points (2-3-5) in that March 6 victory, the first five-point game by a Griffin since Eric Tangradi (2-3-5) on March 11, 2016 vs. Manitoba...In 6 GP in the season series, Terry has six goals among 11 points, both of which are the most for either team...In two games, Patrik Rybar shows a 2-0-0 record to go along with a 2.40 GAA and a 0.925 save percentage...Harri Sateri is 2-2-0 in four games against Texas with a 3.28 GAA and a 0.882 save percentage...Derek Hulak, in his first season as a Griffin, made his AHL debut with the Stars during the 2013-14 campaign and helped Texas win the 2014 Calder Cup...Appearing in 142 regular season games with the Stars from 2013-16, he compiled 86 points (39-47-86), a plus-18 rating and 42 PIM...Hulak added one goal in 10 Calder Cup Playoff contests...Dominik Shine and Texas forward Robbie Payne played college hockey at Northern Michigan together from 2014-17. Back to Backs: This week will mark the 22nd and 23rd of 26 times total this season the Griffins will play on consecutive nights.